The Penachi is about six hours North of the Coastal city of Chiclayo, Peru. Because the area is very desolate and remote, there is very little commercial activity beyond coffee and sustenance harvesting of tropical fruit and herbs. About 100 miles inland from the Pacific Coast, there is Andes Mountain Jungle, at elevations between 1100 and 1500 meters above sea level, that separates Peru from Equador. It is here in these mountains, that our organic coffee is grown. Cafe Femenino has been able to bring technological assistance to train the farmers in active organic growing practices, to improve their harvesting, processing and drying methods. When you try this coffee, you will be taken by suprise and immediately recognize the hard work that has gone into this fine coffee. It is bright and lively, with good acidity, medium body and with a pleasurable sweet finish. Medium Roast. The coffee is grown at altitudes varying between 5400-6900 feet, and encompassing five distinct zones. The result is a smooth, bright and deliciously well-balanced cup of coffee. Medium Roast. The Blended sampler pack is a great way to explore four of our most popular blended coffees. It contains four 12oz packages featuring: BJ's Primo Blend, Roastmaster, French Roast, and Mocha Java. The Cafe Femenino Organic sampler pack is a great way to experience four of our most popular Cafe Femenino organic coffees. It contains four 12oz packages featuring: CF Dominican Republic, CF Peru, CF Nicaragua, and CF Columbia. 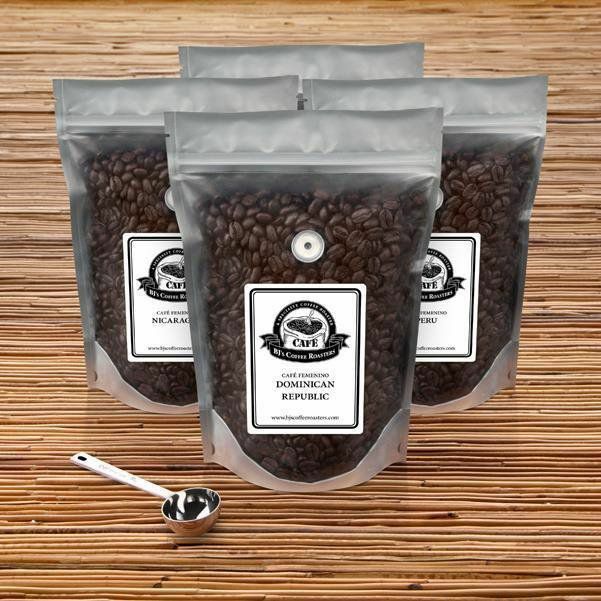 The Decaf sampler pack is a great introduction to four of our best-selling decaf coffees. It contains four 12oz packages featuring BJ's Primo Decaf Blend, Columbia Decaf, Ethiopia Decaf, and French Roast Decaf.